For detailed information please choose the program that interests you. We strive to support community programs that reflect our core values and serve as a vehicle for outreach and support. 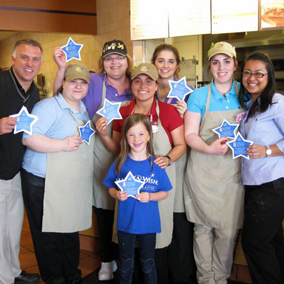 In the greater Chicago area, we’ve partnered with Make-A-Wish® Illinois in giving back to the community. 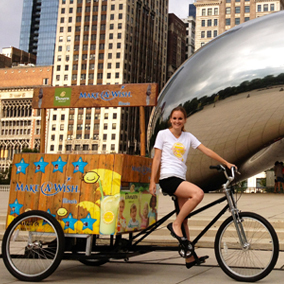 2015 marks our sixth year of partnership with Make-A-Wish® Illinois. Since the partnership began in 2010, we’ve granted over 100 wishes and donated over $500,000 through yearly campaigns like Lemon-Aid for Kids and the collecting funds in our Community Bread Boxes. Visit for more information about Make-A-Wish Illinois. Another component of the Operation Dough-Nation® program is our commitment to giving back to those who are hungry in our community. At the end of each day, all unsold bread and bakery products are donated to local food banks and pantries. Note: in order to participate, a receiving organization by must be a 501c or tax-exempt government or church organization. Donations are picked up weekly on an assigned night. All items are to be given to the ill, elderly, poor or infants/children. If you would like to be one of our “Day-End” partners, please SUBMIT an online request. Our fundraising program is designed to raise money for local school groups, sports teams, PTOs/PTAs, and charitable organizations by donating a percentage of sales back to the organization on a designated day. 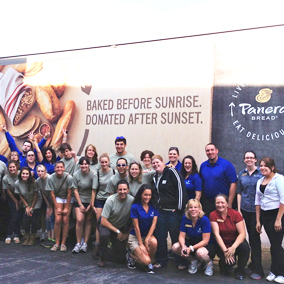 It’s a great way to combine great Panera food, fun and a good cause – your group! Step 1: Submit an online request below. Please note, you will be required to upload a copy of your organization’s nonprofit tax determination letter with the request. Step 2: If your organization’s application is approved, we will send an email confirmation and a customized flyer with which you can promote your event. Step 3: Promote! E-mail and hand out flyers to everyone you know. Step 4: The guests you have reached through your promotion efforts simply present the customized flyer mentioned in step 2 and 3, on the date of your Fundraiser. The flyer will be accepted by cashiers in either printed form, or, electronic image on a smart phone or tablet. All sales associated with flyers will be tracked and credited. Step 5: Your organization will receive 20% of the total qualifying (flyer presented) pretax food and beverage sales. Step 6: You will be contacted with results within 2 weeks and receive your donation check within 8 weeks. Gift cards, retail and catering purchases excluded. Enjoy eating at your favorite Panera Bread bakery-café with family and friends while raising money for your organization. For a sale to be qualified, a flyer must be presented by either presenting the cashier a paper flyer or showing the cashier an electronic image of the flyer (via a smart phone/tablet) at the time of sale. Tax is not credited, only pretax, net sales. A Fundraising Day must generate no less than $75 in qualified sales to receive a donation check. The Fundraising Day can be terminated for any reason without notice such as distributing flyers on the day of the fundraiser within the vicinity of the bakery-café, i.e. ; entrance, parking lot. All required documents must be complete and on file before a Fundraising Day can be confirmed. All forms including the fundraiser request form, completed agreement contract, and non-profit tax-exempt identification letter must be completed and on file before the fundraiser can be confirmed. The customized flyer (printed or electronic image) must be presented at the time of purchase to receive credit. The minimum net before tax food and beverage sale to receive a check for a fundraiser is $75. Fundraisers that do not meet the minimum net food and beverage sales amount will NOT receive a donation. Hamra can terminate all or any portion of the event for any reason without notice such as distributing flyers on the day of the fundraiser within the vicinity (entrance and parking lot) of restaurant. Your organization will be responsible for promoting your fundraiser through whatever communication vehicles your have available. Announce your fundraiser on your website, and add a link to a downloadable PDF of the flyer. Pass our flyers during the large gatherings, group meetings, training sessions and area sporting events. Announce the fundraiser on the P.A. system at a local event. Share the details in your online invitations, such as Evite. If you’re a school, send the flyers home to the parents with the kids. Most importantly, cast a wide net. Talk to everybody. The more people that come to your fundraiser the more money your organization will earn. Don’t forget to remind everyone before the event. The more times people hear it the more likely they are to remember to go. Being a good corporate citizen is important to us. We regularly make in-kind donations to community events and fundraisers. If you are interested in submitting a donation request, please see the information below. Organizations must submit a written request through the online Donation Request form found on this website. Due to the volume of donation requests that we receive, we can only accept requests through this online form. If your organization would like to be considered please review the following terms and conditions and submit a request below. Hamra Enterprises has a policy to reply to all donation requests. If Hamra Enterprises is not able to fulfill your request: you will receive an email to that effect within 6 weeks of your event date. If Hamra Enterprises is able to fulfill your request you will receive an email to coordinate the donation within 2-4 weeks of your event date. Hamra Enterprises reserves the right to require that the organization displays a “Compliments of Panera Bread” sign. Hamra Enterprises reserves the right to specify how the product is displayed and handled at the event/donation. Each donation request must be submitted online a minimum of 6 weeks prior to your event date. NO EXCEPTIONS. Every donation request will receive a response within 2-4 weeks prior to the event date. Freshly baked products will be considered for events with large groups proven through documentation of event registration, letter on company letterhead, event announcements, or any other event solicitation. The organization must be a non-profit, 501-C tax-exempt, and supply Panera Bread with a non-profit tax-exempt identification letter. No exceptions. The organization must be within our vicinity of bakery-cafes or service our market area. The Panera Bread name and logo must be included on event promotional materials not limited to t-shirts, website, email blasts, posters, brochures, banners and any other event related literature. Our logo will be provided upon request. Panera Bread as the event food sponsor must be featured and acknowledged on radio or newsprint articles promoting the event. A booth space must be provided for Panera Bread to be on site if applicable. A Compliments of Panera Bread signage must be placed next to the food donation at the event. The signage will be emailed to you upon completion and submission of the official donation request form, non-profit tax-exempt identification letter and approval per our Marketing Department. This signage is disposable and does not need to be returned to the bakery-café. Products cannot be resold by any organization, even for fundraising purposes. End of day leftover bagels, bread, and pastries are not eligible as in-kind-donations. Hamra Enterprises enjoys being an active member of your community through many charitable programs, including donations but there may be some circumstances and/or company guidelines that prevent us from endorsing your request. A dedicated marketing team member carefully considers each donation request we receive. If for some reason we are unable to fulfill your request, we will continue to do our best to accommodate your needs in the future.